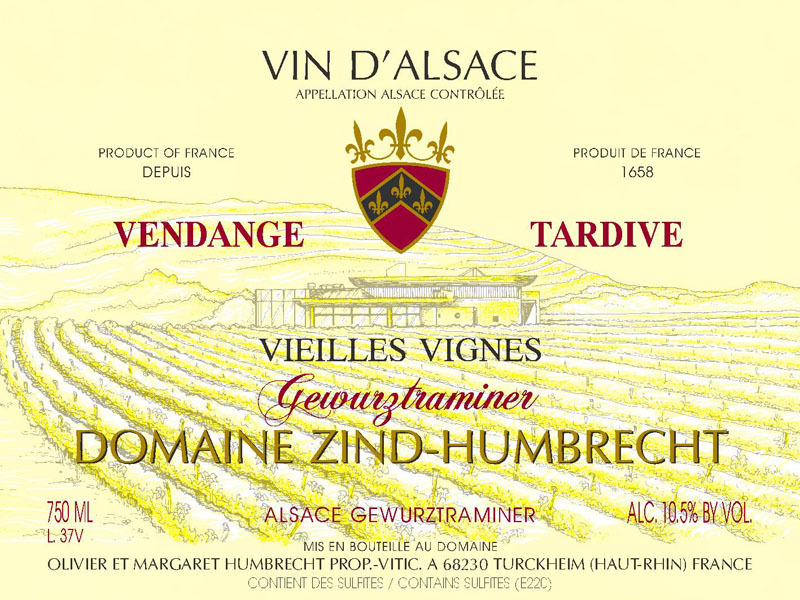 This wine is made from grapes originating from the Wintzenheim old vines and some of the Herrenweg old vines. In both areas, the crop was very small. Both vineyards also have very similar soil type (gravelly alluvial soils) and were harvested the same day. Assembling these two wines allowed us to produce a decent volume. The noble rot had spread a lot over most clusters and it was not a surprise to see that this Vendange Tardive is in fact very close to a Sélection de Grains Nobles in style, ripeness and yields. It wasn’t possible to make any selection at harvest as the crop was already very small! The fermentation was slow and stopped early, keeping a large amount of residual sweetness. 3/2012: the nose is very expressive and aromatic, showing strong ripe exotic fruits and noble rot character (chocolate, roasted aromas, honey). Usually these vineyards do not produce very mineral style wines, but here, concentration and old vines helping, this wine shows a very interesting complex saline finish. The sweetness takes over the palate in a gentle way because the alcohol is quite low and the sensation of acidity leaves a fresh touch. Stilton, Roquefort or a light fruit pie please!